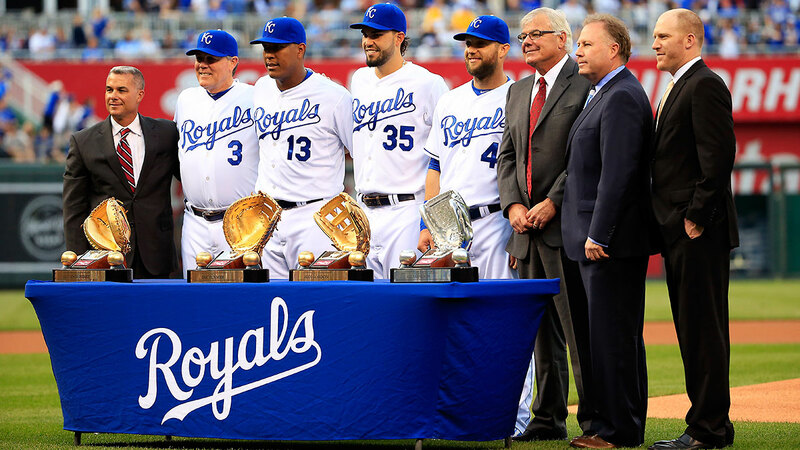 Few thought the 2015 Royals could replicate last season’s Cinderella run, but K.C. has made a mockery of the doubters on its way to the American League’s best record. We were wrong about the team. And we were wrong about the man who built it. The only thing harder than achieving greatness is repeating it, or so goes the cliché that no one bothered to mention to the 2015 Kansas City Royals. You might remember what happened in Kansas City in 2014, when a franchise that hadn’t come close to the postseason in 29 years and sat under .500 in late July finished 41-23 to eke out a wild-card spot, then came back three times to win the greatest wild-card game ever played, then didn’t lose for three weeks on its way to the World Series. Madison Bumgarner ruined the ending, but what an ending it would have been: The Royals were one swing away from one of the greatest storybook seasons in major league history. And no one thought they could do it again this season. This spring, 88 ESPN experts — and I use that term with the sincerest of irony — were asked to predict the division winners. Just three picked the Royals to win the AL Central, making a fine prologue to The Planet of the Apes, as 88 primates throwing their feces at the wall would have hit the Royals’ target 17 or 18 times. And yet the humans were still more optimistic than the computers: PECOTA, the venerable dean of algorithmic projection systems, pegged the Royals for a 72-90 season. Like all bad predictions, this one was born of good intentions. For starters, while the story of the 2014 Kansas City Royals was great, the actual 2014 Royals weren’t; they won just 89 regular-season games, which wouldn’t have qualified them for the AL playoffs in 2013, and they outscored their opponents by just 27 runs all year. Second, their two signature strengths, defense and relief pitching, are two of the most volatile qualities a team can possess. Defensive skills tend to peak at a much earlier age, meaning an aging roster will be hard-pressed to maintain an elite defense, and relievers come and go like tumbleweeds. With an above-average but not spectacular defense and bullpen, the 2014 Royals would have been a .500 team at best. So accounting for likely regression in those areas, that seemed like a reasonable expectation for the 2015 Royals. Finally, three key members of the 2014 Royals had departed as free agents, and the players that GM Dayton Moore had signed to replace them all seemed like downgrades. Edinson Volquez delivered a nice bounceback season in Pittsburgh, but he had been below-replacement level his previous three seasons and was being asked to replace James Shields, the Royals’ ace. Kendrys Morales had just hit .218/.274/.338 in 2014 and was being asked to replace longtime DH Billy Butler, three years his junior. And Alex Rios was slightly older, a slightly worse hitter, and a slightly worse defender than the man he replaced, Nori Aoki. Characterizations of the Royals’ offseason ranged from disappointing to disastrous. A team that wasn’t nearly as good as it had looked in October hadn’t upgraded at any position, didn’t have any minor league phenoms ready to step in, and had replaced three free agents with inferior players. It seemed like a recipe for turning the 2014 Royals into a one-hit wonder. Instead, the 2015 Royals have done to the regular season what the 2014 Royals did to the postseason, an accomplishment that, given the crapshoot nature of October, is significantly more impressive. K.C. started the season 7-0 and pulled away from there, finishing April 15-7 after outscoring opponents by 45 runs in 22 games, its largest run differential in any calendar month since August 1980. They’ve managed a winning record in every month. They’ve won the close games (22-13 in one-run games) and the blowouts (21-10 in games decided by five-plus runs). They have a winning record against all three AL divisions and a winning record in interleague play. They’re tough to stop early, leading after the first inning 43 times and trailing after the first inning just 25 times, and they’re almost impossible to beat late, going 11-2 in games that were tied after six innings. They win at full strength, going 48-33 before arguably their best player, Alex Gordon, tore his groin going after a fly ball, and they win when down a man, going 32-17 in Gordon’s absence thanks in part to the additions of Johnny Cueto and Ben Zobrist at the trade deadline. They haven’t had a losing streak longer than four games all year. All they do is win, at a pace not seen in these parts in 35 years: They’re further over .500 than they have been since the end of the 1980 season. And the more they win, the more we have to question not just whether we misjudged the 2015 Royals, but also the man tasked with putting the franchise back together for the last nine years: Dayton Moore. 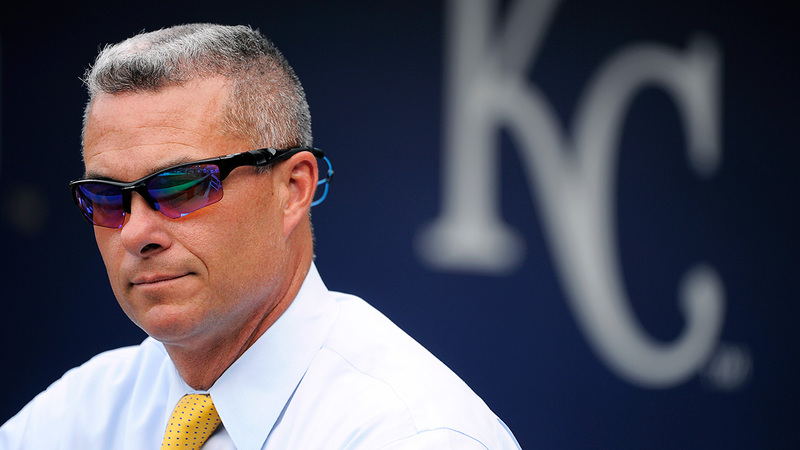 Ed Zurga/Getty Images Dayton Moore inherited a 100-loss Royals team and needed the better part of a decade to fix it. The Royals hold the best record in the American League because basically every warning sign for why they should decline turned out to be a false alarm. Concerned their defense would regress? Per FanGraphs, the 2013 and ’14 Royals were 88 and 75 runs above average defensively, respectively, the second- and fifth-best marks in a database that goes back to 2002. With a month left in the season, the 2015 Royals are already at plus-61 runs on defense, nearly three times as good as the second-place AL team (Tampa Bay, at plus-22). Since advanced defensive metrics were first invented around the turn of the millennium, no team has put together a defense as consistently great as the 2013-15 Royals. Concerned their bullpen would regress? 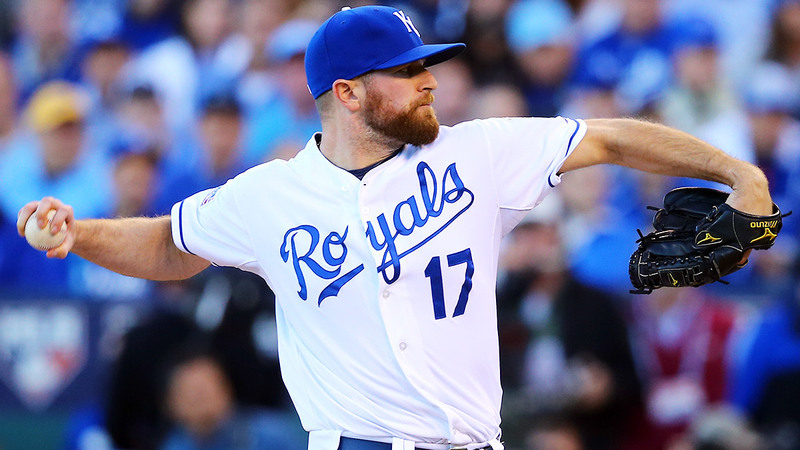 While Greg Holland has a 3.83 ERA after battling a cranky arm all season, Wade Davis and Kelvin Herrera have been just as effective as they were last year, and the pen has gotten an added boost from Ryan Madson (2.45 ERA) and Franklin Morales (2.13 ERA). Luke Hochevar, still working his way back to full strength following Tommy John surgery, has a 3.29 ERA. Brandon Finnegan had a 2.96 ERA before he headlined the Cueto trade. The Royals bullpen is so deep that the team had to release Jason Frasor because of a roster crunch while Frasor was carrying a 1.54 ERA. Their excellent bullpen factors heavily into their success in close games, which is why for the second straight year the Royals’ record is substantially better than their run differential would suggest. They’ve outscored their opponents by 95 runs, a good sum, but one that pales in comparison to the Blue Jays’ plus-197. The Royals have exceeded their Pythagorean record by a full four wins. As a whole, the Royals bullpen this year has a 2.37 ERA, which would bump aside the 2013 Royals for the lowest mark for an AL bullpen since the 2.35 mark of the 1990 A’s. The bullpen has been so unbeatable that the Royals did not lose a game they led after seven innings from May 5, 2014, until August 12, 2015; in between, they won 111 consecutive games that they led after seven, the second-longest streak in recorded history.1 The only team with a longer streak, the 1998-99 Yankees (115 straight), was arguably the best team of all time and had inarguably the greatest reliever of all time. So the 2013-15 Royals have one of the greatest defenses ever assembled and one of the greatest bullpens ever assembled.2 And neither skill has been caught in the whirlpool of regression yet, allowing a team with a shaky rotation and mediocre lineup to produce the fourth-best record in baseball over that time. As for the trio of free agents that Moore brought in: Volquez has been a reasonable simulacrum of Shields at half the price, making every start and posting a 3.27 ERA while throwing 30 more innings than any other Royal. He’s on pace for his best bWAR total since 2008. Morales, meanwhile, has proven correct the Royals’ assertion that his disastrous 2014 campaign stemmed from his being forced to miss spring training and the first two months of the season for non-baseball reasons.3 With the benefit of six weeks in Arizona to get his swing down, Morales’s performance (.288/.354/.471) is back in line with his production from 2012-13 (.275/.329/.457). As for Rios … well, no team can make all the right moves. Rios has continued to decline, hitting .253/.288/.333, and even manager Ned Yost, whose patience with his players is legendary, has hinted that Rios may be playing his way out of a job. Rios, at least, was signed for only one season, while Volquez and Morales are under contract (at what would now be below market value) for 2016. The continued dominance of the team’s defense and bullpen and the adequate replacement of its departing free agents would explain how the 2015 Royals are playing as well as the 2014 Royals did. But this year’s Royals are in fact playing at a considerably higher level than last year’s. They’ve already won 81 games, which is more than they won in any season but one from 1994 to 2012. They appear a lock to win 90 games for the first time since 1989, which would make them the first team since the 1919-25 Philadelphia A’s to increase their win total six years in a row. They’ve pretty much locked up their first division title since 1985. They have a shot at 100 wins, a mark reached just once in franchise history, in 1977. 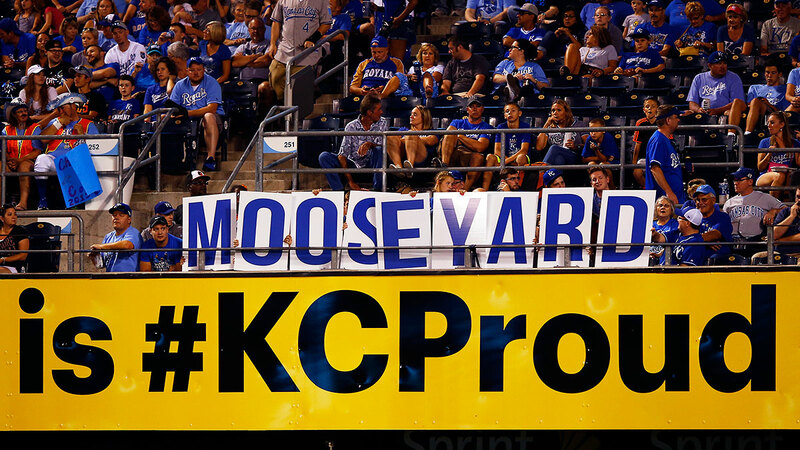 Jamie Squire/Getty Images Mike Moustakas has become a fan favorite anew after reinventing his offensive approach. The Royals have taken a leap forward in large part because four years after The Greatest Farm System Ever reached the major leagues, the jewels of that youth movement are making The Leap. Eric Hosmer is finally building on the potential he showed as a 21-year-old rookie four years ago, hitting .309/.370/.466. 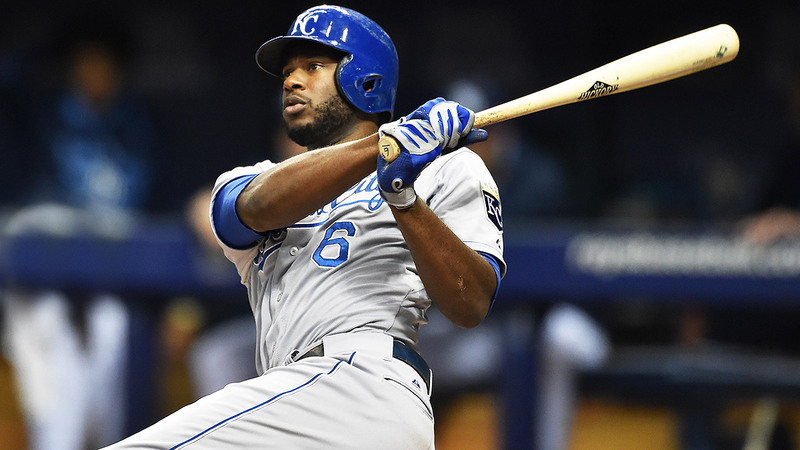 Lorenzo Cain, who didn’t get a chance to play regularly in the majors until he was 26, has built on his career-best 2014 by adding power to his game, hitting .313/.369/.490. Add in his elite defense in center field and Cain ranks third among AL position players in bWAR, behind only Josh Donaldson and Mike Trout. But the player whose breakthrough this season most symbolizes the team’s, and provides the most evidence that the long-maligned front office actually knows what it’s doing, is third baseman Mike Moustakas. While Hosmer had been a disappointment coming into the season, Moustakas was in danger of being a complete bust. After a promising rookie season in 2011 and a 20-homer season in 2012, Moustakas cratered, hitting .233/.287/.364 in 2013 and .212/.271/.361 last season, briefly getting demoted to the minors. 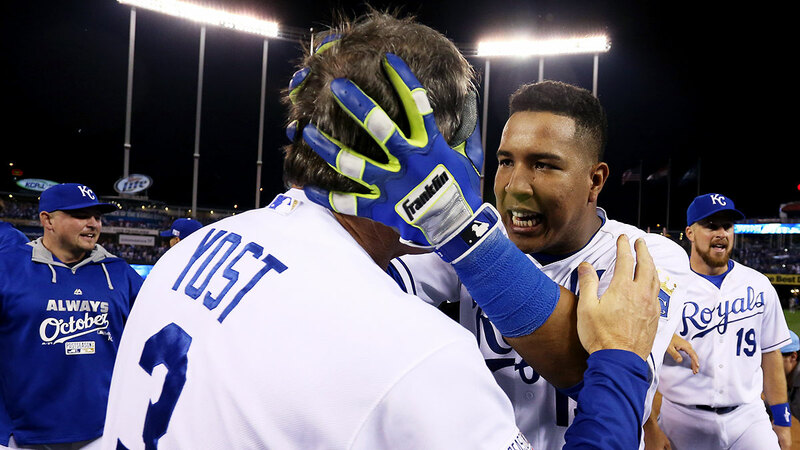 He batted ninth throughout the postseason, and while he led the Royals with five homers in October, he also hit .231. Moustakas had been a slugger since his minor league days, so it raised eyebrows when the Royals spent this spring trying to turn him into an opposite-field hitter — but nothing like the eyebrows that were raised when Yost hit Moustakas second on Opening Day. And on Opening Day, Moustakas hit to the opposite field, 405 feet. It was the first opposite-field home run of his career. One of the game’s most extreme pull hitters, who was getting crushed by the defensive shifts deployed against him, was reborn as an all-fields spray hitter. Moustakas had 18 opposite-field hits last season, a total he exceeded this year by mid-May. He hit .356 in April, and while his numbers inevitably dropped over time, his season line of .282/.348/.447 is well above league average. After barely being above replacement level the last two years, Moustakas has 3.9 bWAR with a month to go in the season. Correlation doesn’t always imply causation, but in this case, it’s pretty much impossible to argue that Moustakas’s new approach at the plate isn’t directly responsible for his newfound success. Which means we once again have to ask the question: Were we all wrong about the Kansas City front office? Dilip Vishwanat/Getty Images Wade Davis has been borderline untouchable out of the bullpen in 2014 and ’15. Royals fans have had a complicated relationship with Moore, who was hired in June 2006, a season in which the Royals lost 100 games for the fourth time in five years. He inherited a mess that would take a long time to fix, a point he was sure to mention at regular intervals over the years. But no mess should have taken this long to clean up; as late as 2012, the Royals still hadn’t won more than 75 games in a season under Moore. Six years was enough time for the Washington Nationals to collapse (from 73-89 in 2007 to 59-103 in 2009) and rebuild (98-64 in 2012), while the Royals were going nowhere fast. Though the farm system was slowly turning into a juggernaut, Moore was doing things at the major league level that defied understanding. He gave Jose Guillen a ton of money to be an RBI guy even though Guillen was bad at pretty much everything except amassing RBIs. He acquired Yuniesky Betancourt. He signed Willie Bloomquist and traded for Mike Jacobs. He ensured that Hochevar and Kyle Davies stayed in the rotation, year after year, despite the fact that neither guy could get anyone out. He acquired Betancourt again. The natives became restless, and when Moore traded top prospects Wil Myers and Jake Odorizzi to Tampa Bay for Shields and Davis after the 2012 season, it looked like a desperation trade that would seal Moore’s fate in K.C. The Myers-Shields trade did turn out to be a watershed moment for Moore, but not in the way some of us expected. Because from that trade on, Moore’s track record has been damn near perfect. The trade itself worked exactly the way the Royals expected it to: Shields was a durable top-line starter, if not quite an ace, and Davis has been exceptional in the pen. While Odorizzi has been a quality no. 3 starter in Tampa Bay, Myers, after his AL Rookie of the Year season in 2013, has rarely been healthy, rarely been effective, and almost never been both, and he got shipped to San Diego this offseason. Moore’s other moves haven’t been as scrutinized, but they’ve been nearly as successful. He acquired Ervin Santana for a song from the Angels and was rewarded with an excellent season in 2013 and a supplemental pick when Santana signed with the Braves. He signed Jeremy Guthrie to a three-year deal to be an innings-eater in the rotation, and Guthrie was exactly that for two years before finally wearing out this year. Adding all that bulk to the rotation in 2013 finally allowed the Royals to move Hochevar, a former no. 1 overall pick with a 5.39 career ERA,4 to the bullpen, where he posted a 1.92 ERA. When Hochevar’s elbow blew out the following spring, the Royals moved Davis, who had been a disappointing starting pitcher for the team in 2013, to the bullpen. Davis’s failure as a starter opened him up to a level of success no pitcher had ever achieved before. His 1.00 RA5 last year is the second-lowest in major league history for a pitcher with 54 or more innings. The lowest? His 0.99 RA this year. Other moves paid off as well: Aoki was the right fielder and leadoff hitter the team needed, and minor in-season acquisitions Frasor and Josh Willingham provided key contributions in the playoffs. The Royals drafted Finnegan in the first round last summer, quickly moved him to the bullpen on the chance he could reach the major leagues in time for the team’s playoff drive, and were rewarded when he threw scoreless 10th and 11th innings in the wild-card game. And after not developing a single quality starting pitcher from within the organization in Moore’s first seven years, the Royals developed two last season: Yordano Ventura and Danny Duffy. The only significant mistake Moore has made in the last three years was signing Omar Infante to a four-year deal, which looks like dead money with more than half of it still on the books. This past offseason was perhaps Moore’s best. In addition to the big-ticket signings of Volquez and Morales, Moore made a number of agate-font-size transactions that have paid significant dividends. When the market for right-hander Chris Young, the 2014 AL Comeback Player of the Year with Seattle, strangely dried up, Moore signed him to a heavily incentive-laden deal. Young began the season in the bullpen but was called into emergency duty in the rotation in May, and he responded with a 3.49 ERA in 16 starts before the acquisition of Cueto allowed him to return to relief. Young, at least, was guaranteed a roster spot. Franklin Morales made the team as a non-roster invitee after a difficult season in Colorado’s rotation, becoming another bad starter turned excellent reliever. So did Madson, who hadn’t pitched in the majors for three years after his recovery from Tommy John surgery went sour. Even Joe Blanton, who didn’t appear in the majors in 2014, gave the Royals 42 innings with a 3.89 ERA after getting called up in mid-May. And finally, there’s Kris Medlen, who got a two-year deal despite no expectation he would contribute much in 2015 after he underwent a second Tommy John surgery before last season. But since returning in late July, Medlen has not only forced his way into the rotation, he’s looked so good that he might be one of the team’s playoff starters. Which leads me to ask, for the third time: Were we wrong all along about Moore? Jamie Squire/Getty Images Gold Glove winners Salvador Perez, Eric Hosmer, and Alex Gordon have contributed to the Royals’ superb defense. One thing you have to keep in mind when trying to figure out the Royals: They’ll never let you in on what they’re thinking. Moore trained as a front-office guy under John Schuerholz in Atlanta, where the art of the uninteresting quote was refined to a science and where leaks were stamped out ruthlessly. As a result, Moore’s Royals play things very close to the vest. They’re not averse to talking with the media, but if you interview Moore for 15 minutes, you’ll realize when you go to transcribe what he said that he didn’t give you a single new piece of information. You have to react like Ron Burgundy in Anchorman: I’m not even mad; that’s amazing. Maybe proprietary information is the new market inefficiency. But the other thing you have to keep in mind when trying to figure out the Royals is this: The quality of front offices in baseball today is dramatically and irrefutably higher than it was 15 years ago, or even nine years ago when Moore was hired. The fifth-worst front office today would run circles around the fifth-best front office from, say, 2002, the year before Moneyball was published. Bill James made this exact point recently. Front offices employ more competent people, and employ more people, period. A generation of sabermetric thought has seeped into every front office in the game. Everyone understands that OBP is important. No one cares about a pitcher’s win-loss record anymore. Every team limits its pitchers to strict pitch counts. RBIs are seen as a reflection of opportunity as much as performance. Closers aren’t generally seen as a magical species of pitcher that can handle the pressure of the ninth inning, but merely as good relievers who’ve been given the opportunity to pitch the ninth inning. Draft picks and prospects are properly valued, meaning teams rarely sacrifice their first-round picks to sign middling free agents anymore. And new sabermetric principles are quickly accepted after being discovered. Defensive shifting was practically unheard of five years ago; now it’s used to some degree by every team. The ability of catchers to frame pitches, unmeasurable five years ago, is now generally understood to be worth up to dozens of runs per season. The recent evidence that starting pitchers lose effectiveness every time they go through a lineup has led teams to pull their starters earlier and earlier. Measuring defense was a near-impossible task at the turn of the century, but we have pretty good ways of doing so now, and teams that are able to fully mine the new Statcast data have even more accurate methods. The data available today — and remember that teams have access to far more than what’s in the public domain — enables insights that were impossible years ago. It’s not just that every team owner is looking for his own Theo Epstein and Jed Hoyer; it’s that Epstein and Hoyer have access to information on the 2015 Cubs that they only dreamed about for the 2004 Red Sox. In the span of time that Moore has been a GM, every team in baseball has improved its understanding of the mechanics of the game. Every GM today is better at his job than he was in 2006. Being a successful GM requires showing a willingness to learn new information on the job and adapt your processes accordingly. Which leads me, as someone who has obsessed over Moore’s job performance since he was hired, to posit the following hypothesis: We weren’t wrong to think Moore was a mediocre-at-best GM once upon a time; we were wrong to think he couldn’t get better. GMs, like players, don’t stop learning and improving once they reach The Show, and it would be as silly to think the Moore of today is no different from the Moore of 2006 as to think the same of Jose Bautista or Nelson Cruz. Every GM is better at his job today, and Moore has improved more than most. They focus on other strategies instead, suggesting they believe they’ve hit upon winning formulas that other teams undervalue. For the second straight year, the Royals have struck out more than 100 fewer times than every other team.6 They’ve built a defense and bullpen that are, year in and year out, the best in baseball. We don’t know exactly why on the first one, and we don’t know exactly how on the last two. But just because we don’t know the method to their madness doesn’t mean there isn’t one. Ed Zurga/Getty Images Manager Ned Yost has gone from being a liability to comfortably average as a tactical decision-maker. Having finally embraced analytics these last few years, Moore’s strengths in other departments that are far harder to teach are now shining through. In a world where every team has a general understanding of analytics, the marginal benefit of being a trailblazer has shrunk, increasing the importance of traditional skills like scouting and player development. That plays into Moore’s strengths perfectly. The Royals scout well, particularly in Latin America. They seem to do a good job of identifying players that have strong character, not because they want a bunch of choir boys, but because they believe that players who are motivated to be the best they can be will develop better than others — witness Moustakas’s transformation this season. Their focus on raw athleticism over refined baseball skills may mean their players continue to develop at an age when most players have already peaked — consider Cain, who famously didn’t start playing baseball until his junior year of high school, and is having his best season at age 29. They do a good job of scouting their own prospects and assessing which ones they can afford to part with — not one prospect Moore has traded, Myers included, has made them regret it yet. They’ve assembled an excellent coaching staff; first-base coach Rusty Kuntz has become a minor legend in Kansas City because his expertise in coaching outfield defense and baserunning is considered a major part of the team’s excellence in those areas. And following in the footsteps of his boss, Yost has improved his tactical decision-making, going from being a huge liability to comfortably average in this regard, making him a net positive as a manager given the universally strong ratings he gets for his clubhouse management. Now that they are no longer surrendering to other teams the big advantage that analytics can provide, the Royals’ little advantages are all adding up. Like San Francisco’s Brian Sabean, another GM who was much maligned for his dismissal of sabermetrics in his early years but has turned his public perception around 180 degrees, Moore seems particularly well-suited for an era in which the use of analytics is a given and teams have to differentiate themselves in other ways. Ronald C. Modra/Sports Imagery/Getty Images Lorenzo Cain broke out later than a typical ballplayer, but right on time for the Royals. There’s no guarantee the Royals’ success will extend into October; the nature of the postseason is such that an inferior team on a hot stretch can do to the Royals what they did to the Angels and Orioles en route to the World Series last year. And there’s no guarantee their window to win will extend into 2016. Gordon, Zobrist, and Cueto are impending free agents; Volquez and Medlen can leave after next season, and seemingly half the team qualifies for free agency after the 2017 season, including Hosmer, Moustakas, Cain, Escobar, Duffy, Kendrys Morales, and Davis. There’s a sense of urgency with a team that’s built to win now. To those of us who have lived and died with this franchise for the last 30 years, this is all very confusing — almost as confusing as rooting for a team that’s resting its regulars for the playoffs with five weeks left in the season. That the Royals are the anything of baseball is disorienting enough. For a generation, the Royals were props, redshirts existing only as plot devices. That they are now central characters in baseball’s drama is heady enough; that they are regarded as villains is icing on the cake. Your favorite team can inspire worse emotions than hatred. Pity, for instance. All of this has made the 2015 season a delightful, delicious, dizzying experience. It’s been difficult coming to terms with the reality that Dayton Moore is an excellent general manager, but no more difficult than coming to terms with the reality that the Royals won the pennant last season, or that this season they really are the best team in the American League. “Recorded history” starts in 1914. Granted, there is some overlap between the two, as the Royals’ elite defense makes their relievers even more stingy with allowing runs than they otherwise would be. Morales declined the Mariners’ qualifying offer after the 2013 season, meaning any team that signed him would be forced to surrender its first-round draft pick as compensation. No team was willing to do so, leaving Morales waiting to sign until the day after the June draft, when the compensatory requirement expired. Hochevar has the second-highest ERA in major league history for a pitcher with 125-plus starts. The highest? His old teammate Kyle Davies. The early Dayton Moore years sucked. The same thing as ERA, but counting unearned runs. And for the second year in a row, the team with the second-fewest strikeouts is the sabermetric vanguard, the Oakland A’s. Makes you wonder. This may seem like a no-brainer, but consider that back in 2012, the playoff-bound Reds elected not to promote Billy Hamilton — who had just stolen a professional baseball record 155 bases! — in September.